Here is just one example of the mapping that resulted from our 2011-2015 amphibian project. 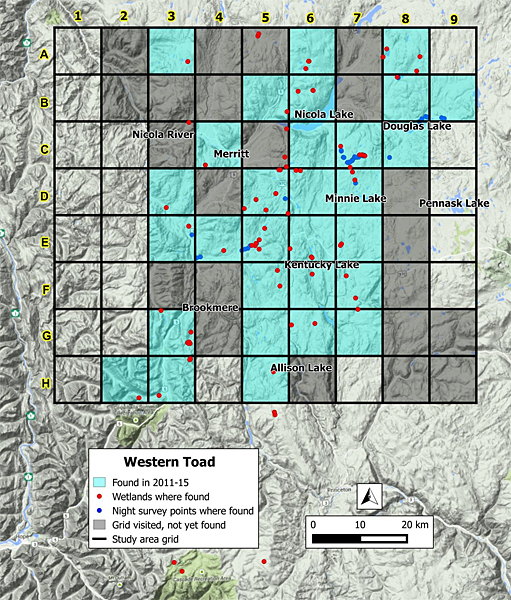 This map shows the 10 x 10 km grids in which the Western Toad is found and the dots show the actual wetlands in which it was found. 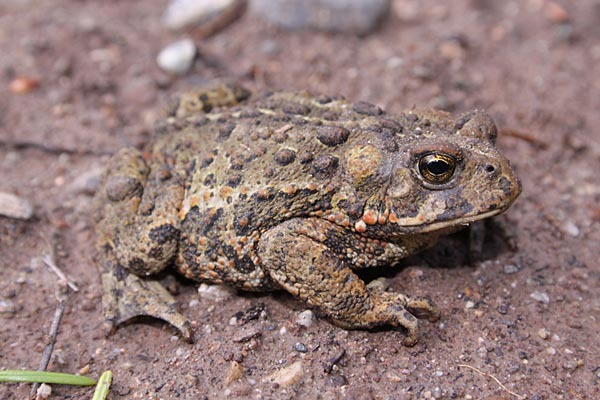 This species is listed as “Special Concern” in Canada so this information is extremely valuable to help protect the toad and its habitat. points (purple symbols) where the species was found. The NNS received grants from the BC Public Conservation Assistance Fund to assist with the amphibian monitoring project. The Biolinx team also received funding from the BC Habitat Conservation Trust Foundation to participate in this project. Our project is part of the BC Frogwatch program. Keep scrolling down to see links to earlier reports and web-postings. Under the guidance of Dr. Kristiina Ovaska, a herpetologist from Biolinx Environmental Research Ltd. in Victoria, the Nicola Naturalist Society is undertaking a multi-year amphibian monitoring project. The first phase of the project is to survey local wetlands (lakes, ponds, beaver dams, streams) to find the best places for long-term monitoring. After training by professional biologists, club members do regular sampling and counting of frogs, salamanders and their tadpoles to determine seasonal and annual variations in abundance and distribution. We’ve also been working with BC Parks since 2011 to reduce the roadkill of migrating toadlets in the campground of Kentucky-Alleyne Provincial Park near Merritt. The reports on this project are available here too (link to the latest report is above; for earlier reports scroll down). The links below give more information on this project, allow you to download the data sheets needed for monitoring and reconnaissance, and give updates on the workshops and other events.